Start accepting credit card payments today! 70% of all purchases are made with plastic! Did you know that cash is used at only 25% of point of sale purchases? Predictions are that cash will be used even less as more alternative payment methods become available. Debit and credit cards are used for over 70% of purchases. Customers enjoy the flexibility and ease of using plastic to pay for purchases. And research shows that consumers spend differently with credit cards than they do with cash! "Mental accounting” is the idea that people treat money differently based on a number of factors: where the money came from (salary vs. gift), the size of a transaction, and the form the money is in when a purchase is made. That last one is important – people tend to spend more money paying by card than paying with cash; i.e. when they don't actually see those dollars and cents leaving their hands. You should not use a credit card reader because it is a stealthy way to dupe your customers into purchasing more of your gorgeous veggies. 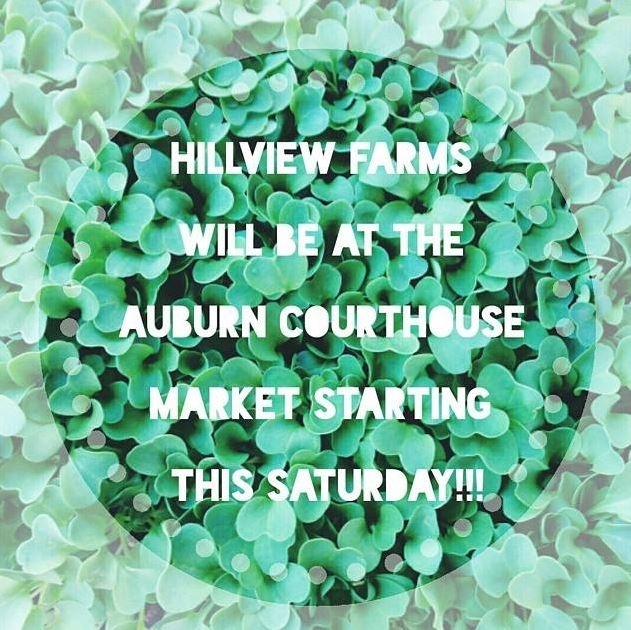 But it is undeniable that accepting cash only sales severely limits the number of potential customers you may have at a farmers' market. But what about the fees?! All credit card processing companies do charge a service fee, usually around 2.75%. It may be a good idea to set a minimum for card purchases – $10. You can also feel comfortable passing the processing fee to customers by charging a convenience fee per swipe (consumers do this all of the time- think about the fees for pumping gas or withdrawing money from an ATM.) 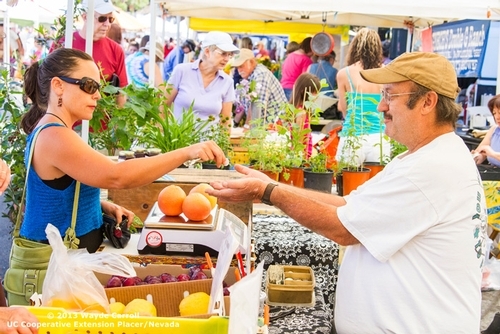 In my personal experience as a farmers' market vendor, customers often forget to grab their cash or hit the bank before a market and are relieved that they don't have to limit their market purchases. They enthusiastically whip out their plastic and are tickled by the user-friendly technology they get to use. Writing a signature across the screen of a smartphone is fun! Remember: you can always let people know that you prefer cash but having your credit card reader will help you build your customer base and make shopping at your market booth more convenient. It will probably also increase your sales. It is very simple to set up and use a smartphone credit card reader. You must have a smartphone that has a data plan (i.e. access to the Internet through a network.) Next step- set up an account with a smartphone credit card reading company. Square Up is the most used card reader available currently, though Intuit and Paypal both have similar products. I recommend Square. It is free, simple, used at many retail locations and customers are familiar with it. Once you have an account set up, you will receive a free credit card reader in the mail.It plugs into the headphone jack of your phone. You will also need to download the free app that accompanies the card reader. If you are feeling intimidated, ask a fellow market vendor for a quick tutorial. Once you have an account with Square, you can customize your account to track your sales. You can create “items” with specific prices or leave prices blank to fill in at check-out (in the case of items that you sell by weight.) A few quick taps of the finger and instead of a $30 payment without any details, you can record transaction details: 1 bouquet, 3 baskets of berries, and 2 pounds of tomatoes. Another great tracking and management tool is the ability to set up employee profiles. Your employees can access your square account using a password that you assign. You are able to specify what each employee is able to do; ie accept payments, access sales records, etc. You will need to update your card reader every year or so to keep up with the changing technology and improvements that Square makes. This is free to do and you will receive a reminder email. You can have as many card readers as you like- always good to have a back-up on hand. Square will save the personal information a customer enters to receive a receipt (either as a text message or email.) You can skip the receipt- I remind people that they will see the charge on their credit card or bank statement. The money you accept through Square is deposited to your specified bank account the next business day. 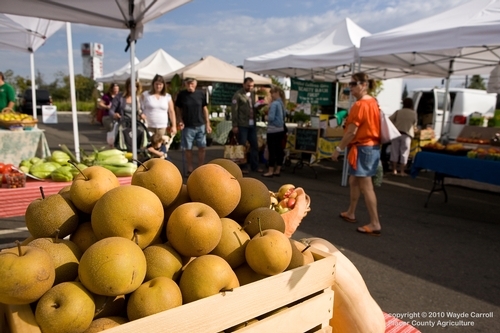 For weekend farmers markets, this means you won't see the money until Monday. 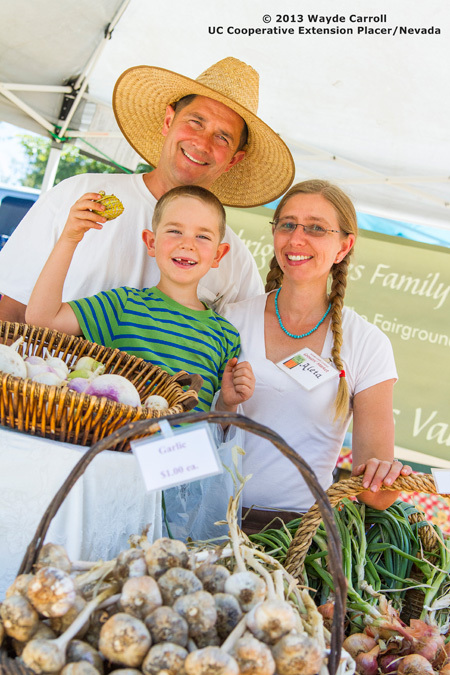 Don't forget to include these sales in your farmers' market accounting. 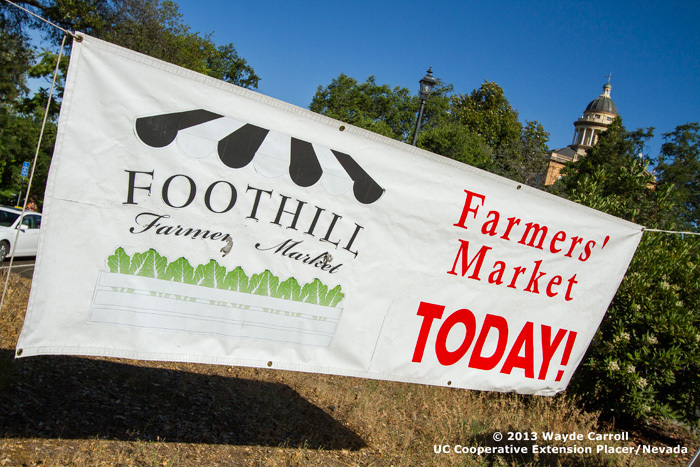 Be sure to make a big sign for the farmers' market letting customers know that you accept plastic! Square will provide you with a small window decal, but you need a sign that catches the eye from across the market! Using this technology is simple and many of you already possess the tools needed (i.e. a smartphone) to offer this simple service to your customers. Get started today! Building a Web Presence for Your Farm Business: Part 3 — Let’s Get Social! In Part 1 of this series of posts, we talked about the differences between personal websites and social media, and the importance of using both for your farm business. In Part 2, we looked at the essential elements for building a compelling website. In this week's post, we'll tackle that love-it-or-hate-it subject…social media! There are a lot of social media platforms out there — Facebook, Twitter, Instagram, Pinterest, the list goes on… but don't worry, you don't have to use all of them! Facebook is the most popular of the bunch, so it's a good starting place — most of your customers are likely to be there. Twitter can be useful for real-time and location-based information (for example, that truckload of kale you'll be bringing to today's farmer's market), but its user base is far smaller. Instagram is a fun and easy way to share photos (and is ad-free, so far). Don't forget to add links to your social media sites on your main website, and vice versa! The same guidelines apply for social media as for websites: choose your best photos, include a bit of background on you and your farm as well as the essential contact information, and include your logo if you have one. Keep in mind that social sites tend to be a bit more “condensed” as far as space for content, and people often view them on mobile devices (that is, tiny screens). It's especially important here to keep your text concise, and choose images that are visually striking, especially at small sizes. Check your social pages and website on as many different devices as you can — computer, laptop, tablet, smartphone — to see how they display on each. The range of social media platforms available can seem overwhelming, especially if you try to tackle too many of them at once… but you probably only need one or two to make an impact. Talk to your customers, find out what social networks they use, and start small — you can always add to your social-media presence as you determine how much time and energy you want to spend. And think about dividing up the work: if someone in your “farm family” really loves being on Facebook, give him or her that job! Enthusiasm really is visible in social media; your followers can tell if you're having fun, or if you're just posting for the sake of advertising. Managing a Web and social media presence can feel like a full-time job in itself, but it really is easy — and even fun — if you tackle the project as a series of bite-size steps. Start with the basics of a simple website and Facebook page, and then you can continue to develop your Web presence as time and resources allow. The key is to get started! • Remember, you don't have to do everything! Begin with basics. Delegate. Grow. • Don't just promote... talk about what really interests you. Tell your story. That enthusiasm and interest comes across in your writing and posting, and helps build the all-important connection to you and your farm. • Think about your audience and customers, their interests, how they use Web and social media. Who are you trying to reach? What are they looking for? Why do they choose to buy from you? • We don't farm just to produce a product. Why do you farm? Share that. Last week, we talked about the differences between personal business websites and social media, and the importance of using both to build your web presence. So — you've set up your Facebook account and bought your website domain name. Now, where to begin? It can be a bit overwhelming designing a website from scratch, and you may find it easier to hire a professional or find a tech-savvy friend to help with the process. Or you can use free, open-source tools like Wordpress to set up a basic site, no programming knowledge required. But whichever way you decide to go, you'll still need to include the same key elements. • Who are you, the farmer? • What do you grow or produce? What is special about your crop(s) and your farm? • How do you grow it? Do you use organic or sustainable practices? All this can be as brief or in-depth as you like, but it all helps to build that sense of connection between you and your customers. Include a bit about the history of your farm, your farming practices, your philosophy. And don't forget basic contact information, too — it's surprising how often people neglect to include their own names on their websites! Be sure that visitors can easily find your preferred contact info, as well as where your farm is located and where to find your products. Once you have your content, it's time to make it look beautiful! Great photos are key to a good farm website. You might want to find a photographer friend, or consider hiring someone. (Getting quality images — especially photos of yourself that you actually like — can be easier with someone else behind the lens.) At the very least, use a good camera; cell phone snapshots just don't quite cut it! 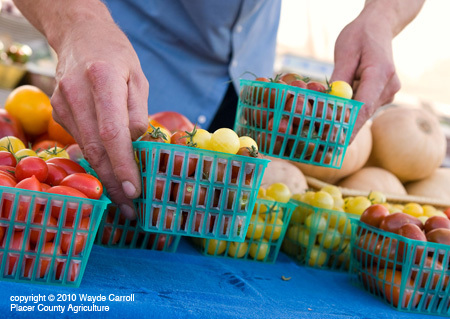 Include pictures of the farmers, the landscape, and some beautiful close-ups of your products. When choosing photos, take a moment to put on your "consumer glasses" and try to look at them as a non-farmer. Does everything look clean, fresh, inviting? (We tend not to notice the junk piles and manure heaps, but your customers will!) Photos are a great way to give consumers a sense of connection to you and your farm, and to build your "farm story," so take the time to choose them carefully and make sure they reflect the bounty and beauty your farm has to offer. Do you have a logo? If not, consider designing one, or choose a font or graphic to identify your “brand.” You can use this same branding across your website, social media, printed materials, packaging, even your farmer's market stand — it helps make your products visibly yours, simplifies the process of designing new elements (such as packaging or your website), and gives everything you do a coherent look and feel. Do you like to write or photograph? If so, consider adding a blog to your site (and updating it regularly!) This is a great way to share what's happening on your farm – and an easy way to add new, current content regularly to your website. Keep it interesting, beautiful, engaging... it's not all just about promotion. Tell your story. One more important detail: many users will be viewing your page on smartphones and other mobile devices, so be sure that your site is mobile-friendly. This ensures that your text will be readable, images viewable, and site navigable on a mobile phone or tablet. Most Web design platforms, such as Wordpress, have mobile device compatibility built in; if you work with a Web designer, check that he or she will be building a mobile-friendly site. You can use Google's Mobile-Friendly Test tool to check a site for compatibility. In Part 3, we'll take a look at adding social media to further build connection with your customers, as well as some further resources and great local farm websites for inspiration! 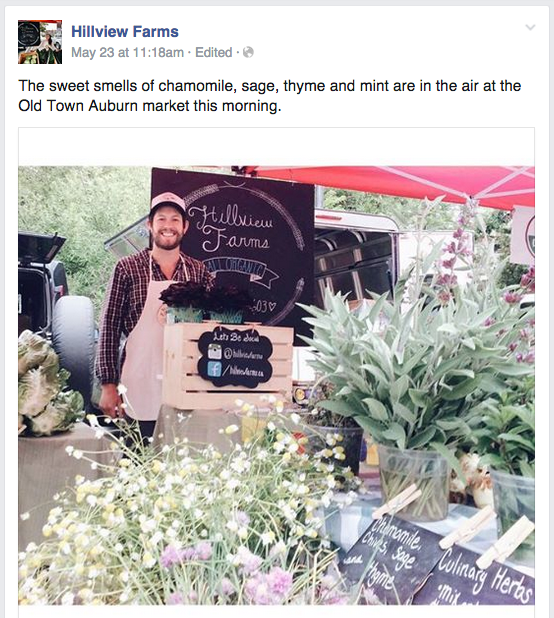 Building a Web Presence for Your Farm Business: Part 3 — Let's Get Social! Most of us don't choose a life in farming because we love sitting at a desk in front of a computer, or because we'd rather be indoors checking email or analyzing Web traffic statistics. But it's a fact of 21st century (business) life: sooner or later, you'll have to get online! Good marketing is key to a successful farm business, and it's now easier than ever to connect with consumers via the Web and social media. The short answer: it's your business card, and it's your story. A website gives you credibility, visibility, a way for people to find you — and a way for you to share who you are and what you do with your customers, and with the world. First of all: what is a “Web presence,” anyway? It can (and should) include both a website and social media (Facebook, Twitter, etc.). Your website gives you credibility, visibility, and search engine rankings — think of it as your storefront. Social media adds interaction, personality, and fun. Wait, I have a Facebook page — isn't that enough? Facebook is great for connecting with your customers, but it isn't a replacement for a website! It may be tempting to use “free,” quick-and-easy social media sites instead of investing time (and possibly money) in building a custom website, but as we all know, you do get what you pay for. Social sites are generally template-based, generic, and limited in flexibility; they give users very little control or ownership of their content. And — though it may be hard to believe — not everyone is on Facebook! Limiting your Web presence to social-media sources can actually limit your reach to potential customers. However, social media does have its advantages. Customers have to make the effort to go find and visit your website, whereas Facebook, Twitter, and the like are more integrated into the daily “stream of consciousness” — your followers will see your updates without actually having to go out of their way to look, and in “real time,” as you post them. This is especially great for announcing market days, specials, and things happening right now. Just picked the first peaches of the season? Make sure your customers are the first to know, and include your favorite peach ice cream recipe! Got a truckload of kale you've just harvested? 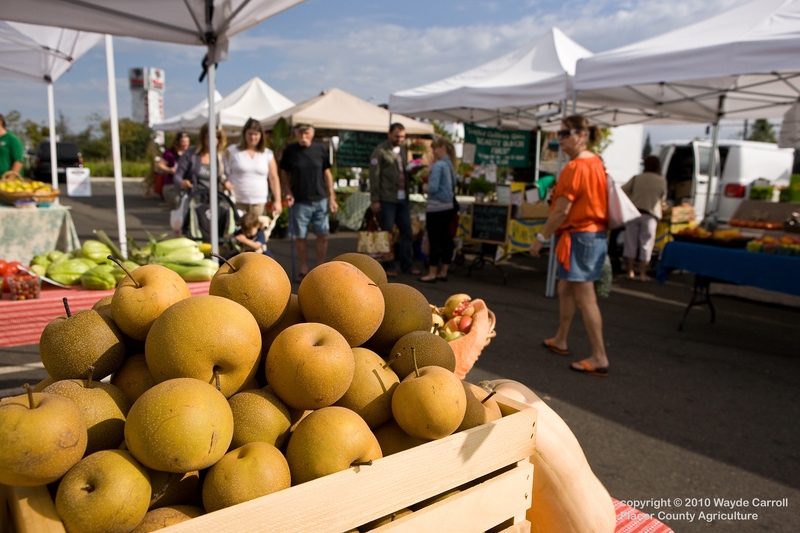 Post a photo announcing your two-for-one deal at the farmer's market today! By contrast, a personal website gives you a “permanent” home on the Web. You own it, it will act as a hub for all the aspects of your Web presence (blog, social sites, etc. ), and you have full control over the content and design. Next week, we'll talk about how to tell your story with great content, beautiful photos, and engaging social media. Stay tuned! Part 3 — Let's Get Social! Social media platforms such as Facebook, Twitter, and Instagram are great places to tell the story of your farm. In a recent survey conducted by Eat Local Placer and Nevada, 60% of participants chose “supporting local farmers” as the primary reason for purchasing locally grown fruits and vegetables. Our community and your customers care about you and your farm business! By sharing photos, thoughts, recipes, the good times, and the bad times you are creating a way for local consumers to feel connected to your farm. If you are already sharing your farm business on social media, it's a great idea to begin thinking strategically about how you post, when you post, and what you share. Everything that you share on the internet (including what you share on your personal profiles) affects your brand. And only sharing what you have for sale and when it is for sale is no fun for anyone- these posts will be regarded as SPAM and your social media profiles will lose attention. The better choice is to think about a larger strategy for sharing the activity of your farm, engaging your community by providing useful and interesting information, and also providing opportunities for people to purchase your products when available. I like to think of posting to social media as story-telling. Many of you chose to be farmers because of the lifestyle it affords. That lifestyle, or at least a romanticized version of the farming lifestyle, is very popular right now. Share your life as a real farmer. Post a photo of your field when you first walk out in the morning. Post of photo of your farm-fresh lunch and include a recipe. Share your thoughts on the drought and its impact on local agriculture. You will gain followers (who are also potential customers) by providing information that is engaging and images that are striking. I challenge you to not paint too rosy of a picture of your farm. Be honest with who you are and what life is like on your farm. Sharing the bad times may engage your community in a “call to action.” Check out the response our farm received when we broke the news about our high-tunnel blowing over in a windstorm. There may be some catharsis in sharing the hard times; so often we farm alone and can feel isolated and unappreciated in hard times when, in reality, we are a part of a community that is deeply invested in our well-being. Post useful and interesting information. Remember- you must be actively farming for your story to have value. Follow the 80/20 rule. 80% of your posts should be interesting and useful, 20% of your posts should encourage sales of farm products. Post regularly. Avoid posting erratically. Try to share a couple of times a day. Post at the right time. Posts between 1:00 p.m. and 4:00 p.m. tend to be viewed by the most people. Share your personal life with intention. Everything you put on the internet affects your business reputation. Think wisely about the parts of your life you may want to keep out of the public domain. Have a strategy. Simply using a social media platform is not a marketing strategy. What, how and when you post is the strategy. Set a goal, like increasing sales of a new crop at the farmers' market, and then craft your posts with this goal in mind. Make your social media presence known. Follow and share other peoples' posts to increase your own visibility. Ask your friends to “Like” you on Facebook. Be sure to put up a sign at the farmers' market letting your customers know how to find you on the internet. Don't become addicted! There is so much information on the internet. Don't get bogged down by social media posting and don't spend too much time doing it. Set limits for yourself if you feel like you are spending too much time online. Those carrots won't plant themselves!